Click on the picture, and order your favourite Byodinamic Syrup! The properties described derive from the widespread and popular historical bibliography and are not intended to suggest treatments which are down to medical relevance. Given that herbs for biodynamic preparations (yarrow, chamomile, horsetail, nettle, oak, dandelion and valerian) are healing plants for the soil, I thought to use them like healing and regenerative plants for our “personal soil” (physical body) in a immediately “ready to use” and able to kept form: this idea became reality thanks to the collaboration with the Laboratory Eupithos. 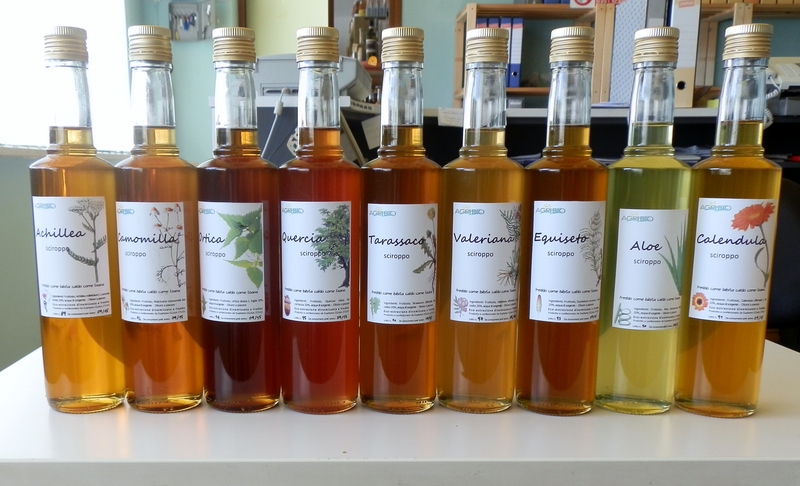 We have added eleven more particular syrups at the seven ones for the biodynamic preparations. I consider these new ones, usually not available as syrups, useful and interesting for human use. The dosage of ” Agri.Bio Biodynamic Syrups” is 1/7, and the can be mixed with both cold or hot water and drunk as a refreshing drink or as a herbal tea. Each syrup (500ml) costs € 14.50 except “Scented Geranium” which costs € 16.50, and we have chosen to use bd fructose as sweetener. Here below, some hints about properties and actions of every essence used. Aperitif and digestive, healing for gastric ulcers, with Oak. It awakes blood circulation protecting and nourishing veins and capillaries. Excellent as antioxidant due to the high content of precious flavonoids, it encourages the ability of grasping ideas and jumping at intuition, when needed. The plant is famous for its ability of making degenerative illnesses going backwards. Its properties are due to the high content of important elements such as minerals, vitamins, enzymes, amino acids, chlorophyll. They restore the right levels in the body, which is made easier in promoting its detoxification and in returning to a state of well-being. It is an vasodilation hypotensive and has an estrogenic action suitable for every problem due to the female cycle. It brings benefits in liver congestion. Its precious mucilage make it a good cure for herpes sores, wounds, abscesses, being emollient, balsamic, antiseptic, soothing also for internal use. The plant is named after the roman calends, the date which marked each month the moon reappearance, with its flowering. It has some properties such as: analgesic ones for trigeminal and sciatica, sedative ones for gastric, abdominal, uterine pains. It is soothing for headaches due to the influences and also resulting from menstrual pain. The sedative and anti-inflammatory is also indicated for the serious suffering people to whom it gives strength and calm in order to bear pains and fears and strengthens the etheric body. It is known as flavoring spices in cooking preparations but it has great digestive, tonic and antiseptic properties, and it normalizes glucose levels in blood. Thanks to its digestive support, Cinnamon is suitable for flatulence and gastric and intestinal atony. It’s a powerful anti-bacterial, having many antioxidants is an anti-aging, reduces emotional eating and has great hypoglycaemic effect. It has excellent digestive action and powerful antioxidant and protective effect for the liver; it is lately tried out in some serious degenerative diseases, but is contraindicated in pregnancy as it is an uterine stimulant. It stimulates the liver and increases the secretion of bile fighting calculi. Complete remineralizer, up to heal fractures, and makes tissues more elastic, thanks to the big amount of organic silicon. It is involved in the recovery of tendonitis, sclerosis and cartilage degeneration. It is a revitalizer and important anti-anemic with Nettle. It brings formative forces. Great thirst-quenching. Balsamic reinforcer, general antiseptic, powerful stimulant for surrenal and great energy producer for all organs. Expectorant and best remedy for colds and bronchitis. It brings light into the thoughts and vitamin C and stimulates the nervous system. R. Steiner recommended the use of pine buds for the treatment of diabetes, is useful for eye pain and its action strengthens the ego,. It has a rebalancing action, is used in aromatherapy to boost the imagination and intuition in order to be able to find solutions in difficult or messy situations. It stimulates the desire to express themselves and brings out what you feel deep inside, it helps to become aware and balances the give and take. Very suitable for people who do not know what they want because it stimulates their motivation and helps in the achievement of the unspoken desires. Appeal us to everything positive. The word comes from the Latin verb mollire, which means “to soften”. Here below some diseases which may benefit from mallow: cough: mucilage dissolves catarrh and relieves inflammation of the upper airways; constipation: mallow’s mucilage softens feces and promotes their elimination a sweet way, so that this natural laxative is also indicated in pregnancy, colitis and irritable colon syndrome, oral cavity inflammation, gingivitis and stomatitis. With mallow pain goes away! It is detox plant because it stimulates the metabolism but gives back organic iron, calcium, potassium, magnesium, B vitamins and folic acid. Together with Horsetail assists treatment for anemia, for hair loss and nails and bones brittleness, is the best general tonic in cases of seasonal tiredness or continuous stress. It is known thanks to its action of fighting against rheumatic diseases, especially gout, , muscular rheumatism and the joint ones. It brings order and develops verticality. It has a tonic action for the body, it’s antiseptic and reduces fevers supporting healing. It is a powerful astringent in cases of intestinal and gastric pains, for diarrhea or hemorrhagic disorders, such as for children urine incontinence. The oak bark balances etheric excesses. These mountain berries contain extraordinary vitamins, which are essential for the health and the prevention of cell aging, the collagen degradation, osteoporosis, and the difficulty of microcirculation, hindering eye problems. Strengthens the lungs, the ego and nerves and senses organization, reinforces the eyesight and disinfects the urinary tract. Useful for headaches, especially the children ones. According to recent researches, the regular use of rosemary keeps you young and improves blood circulation, especially helping those who feel powerless and weakened, perhaps due to pressure decrease. Thanks to its powerful antioxidants, rosemary plays a protective role for the liver, an organ which is affected by the effects of stress, and its use helps to increase the memory and is useful in all degenerative diseases. In the Roman era rosemary was already used for medicinal purposes in order to treat toothaches or sprains and stiff neck; today it is used to treat colitis or nausea, as a remedy for rheumatism, the heart aches or digestive problems. Sage it particularly known for its anti-inflammatory, balsamic, digestive and expectorant properties. It also is able to treat painful menstrual syndromes and menopause symptoms (especially that annoying disorder called “hot flashes”: that is why it is also called “natural estrogen”). It offers a good response against water retention, edema, rheumatism and headaches, and is also indicated in gingivitis and abscesses. It is a diabetes “deterrent” and increases the healing process after an injury. It enhances memory and is useful in all degenerative diseases. It has a draining action for the liver, stimulates bile production and the flow to the gallbladder and intestines. It’s a diuretic and laxative, ensures the natural slimming and benefits in arthritis, making it suitable in obesity and also in the metabolic retardations. It connects our thinking with the outer planets and brings joviality. It is the plant of nervous balance, always known as remedy against the strongest insomnia, the neurasthenia or infantile convulsions. It brings benefits in hot flashes and nervous asthma. The use must be limited at 10 days per month in order to avoid the habit which would lead to reduce the effects in a short time. It has a benefic action for the irritation of the respiratory tract, it is an inflammatory which calms stomach aches and general nausea or pregnancy nausea and it’s a powerful digestive too. Stomachic and soothing in case of acute pain, it’s a good stomach strengthener. For any other informations, please, contact us!